In January of this year, my paternal grandmother passed away. It was unexpected, and she was the first of my grandparents to die. The grief I felt the morning I found out came in waves, crashing into me over and over, and even now I am left with a hole in my life that feels as though it carries the weight of a stone. Poet Irene Blair Honeycutt knows this pain all too well herself, having lost three brothers and a nephew in a very short time period. 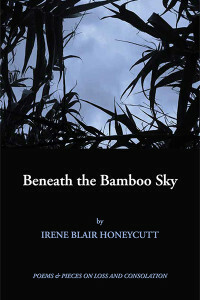 Her book, Beneath the Bamboo Sky, is a touching collection that weaves memory and grief together in a way that uniquely memorializes her lost loved ones, but also makes each poem feel like it could apply to anyone in mourning. cannot predict the hour or the day. Honeycutt’s choice to personify the heart in this way creates an interesting duality that balances out the pathetic appeal of the poem. A series of memories is interrupted with the observation of the heart calculating, attempting to work objectively to figure out how much time is left and how it will possibly handle the grief to come, all too aware that its power of prediction is limited. Its attempt is interrupted by wondering who will be left to remember—its humanity restored by the fear of the void that will be left. Anyone who has known time is running out has done this; attempted to add up minutes and hours and squeeze as much as possible out of them, or regretted time not spent with someone now gone. My favorite poem in the entire collection is “It Is Okay to Weep in the Aisles”. It is a simple, gentle reminder that there is no “right” way to mourn somebody and that loss is an alien concept (until one day it isn’t), and that we will all bear that burden in due time. Red or white? Just choose. Your heart won’t know the difference. then quickly turns and squeezes lemons. We all have our seasons. She can’t know what you know— not yet. There is so much weight and emotion in every line—the feeling that nothing really matters anymore, not to the broken heart whose ache wine cannot subdue; the woman squeezing the lemons that represent grief, her fingers feeling the hard outer rind of it but not yet knowing its bitterness; the cycle of life symbolized by the child, mother, and grieving speaker, displaying the inevitability of the pain we will all experience. It’s a beautiful poem that allows the imagery to speak for itself and fluidly moves through an all too realistic scene. Honeycutt’s poetry is gorgeous and moving, though she occasionally does certain pieces a disservice with choice of form and placement. Some pieces, such as “What the Social Worker Said”, benefit from being in an unusual shape, but other poems seem to lose some power when they’re arranged differently, such as the prose-poetry form of “Gifts”. But this is a minor thing, one that shouldn’t diminish someone’s view of the collection as a whole. It is never far. I can even call it back.